Nothing quite speaks for your character as an eccentric accessory. Of course, if you have rings, bracelets, and pendants already, you might wonder how else you can adorn yourself. Why, we have just the addition for you! Our selection of gothic belt buckles will shock and awe you, while also allowing you to give yourself gothic style in a whole new way! These gothic buckles are all highly compatible with an assortment of other belts, plus we also offer a few belt straps, including ones in leather and fabric webbing that pair perfectly with the buckles as well! They might all be gothic, but they also feature incredibly different styles, ensuring that no matter what you are looking for, you are likely to find it here. 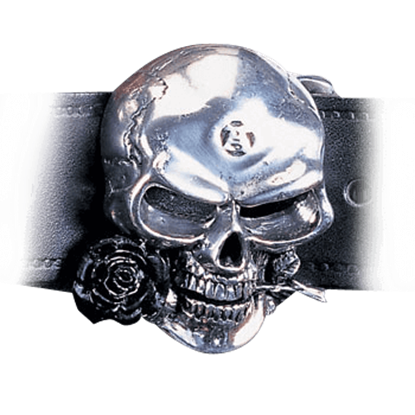 Want to adorn your belt with a wicked skull? Done. Find yourself favoring the wolf within? 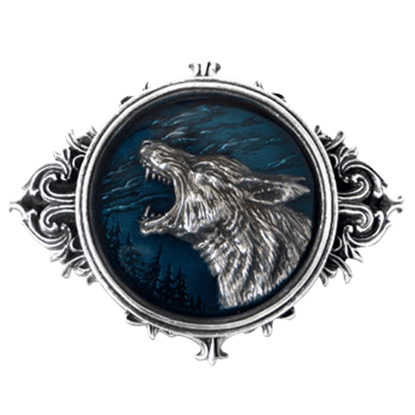 Wear one of our lupine belt buckles to mark yourself as a wolf in sheeps clothing. And these are only some of the possibilities! You think you know everything there is to know about gothic style? Well, think again, and take a closer look at some of the gothic belt buckles you will find right here so that you can be sure that you have fully adorned yourself in perfect gothic style. 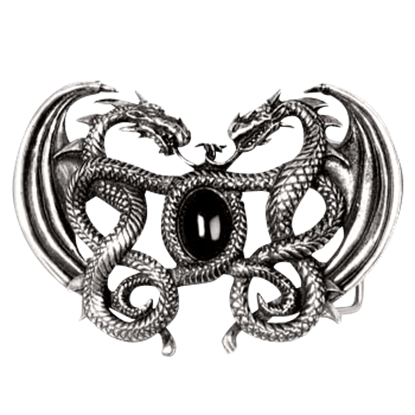 A pair of contesting dragons are what make up this Gramilion Belt Buckle, and there is no denying that the concept is an appealing one. After all, if one calm dragon looks good, then two warring ones must look even better! Originally, letters of marque were actual letters and writs that were given to ship captains that allowed them to sail as privateers. 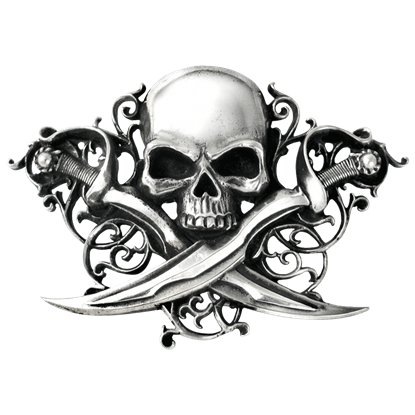 That tradition of legal piracy lives on today, through this Letter of Marque Belt Buckle. Fans of Poe and his particular poetic devices will recognize the word emblazoned on this skull immediately. 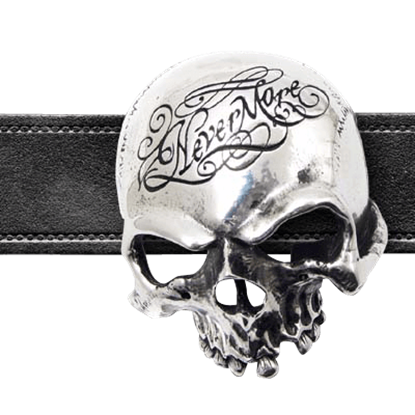 The Nevermore Skull Belt Buckle could be a tribute to his works, so mired in the briefness of mortality as they were. What is the best way to deal with evil? Just ignore it, and more importantly, hear, speak, and see no evil! 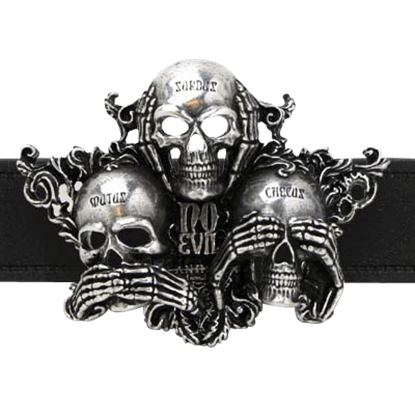 The No Evil Belt Buckle is a reminder that life is too short to waste it on something as petty as evil for evils own sake. 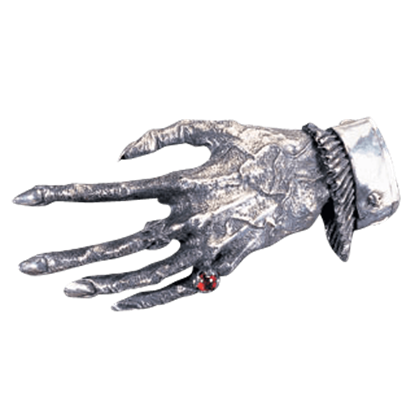 Creeping quietly like the night, this Nosferatu's Hand Belt Buckle is the infamous hand of a withered and undead being that you can wear, allowing it to clutch at your belt strap while adding a touch of vampiric style to your ensemble. Perhaps that pale orb in the sky is not rock at all, but rather bone, and perhaps those craters are actually sutures and sockets. 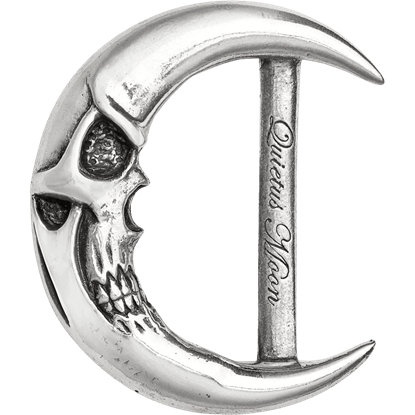 The Quietus Moon Buckle brings these dark ponderings to life and allows you to add them to your ensemble. 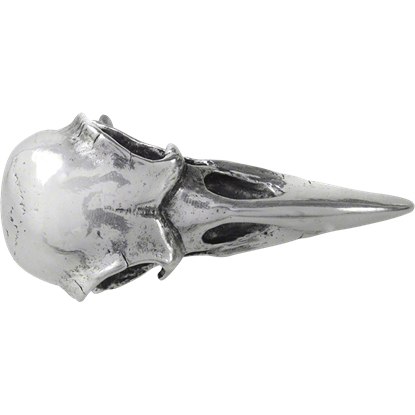 German for Ravens Skull, the Rabeschadel Buckle features a pewter raven skull design that can be attached to a 1.5-inch wide belt. Ravens are famous in myth for their prophetic powers, acting as messengers of Odin. In antiquity, the ram skull was a symbol that could often be seen as a symbol of sacrifice and power. 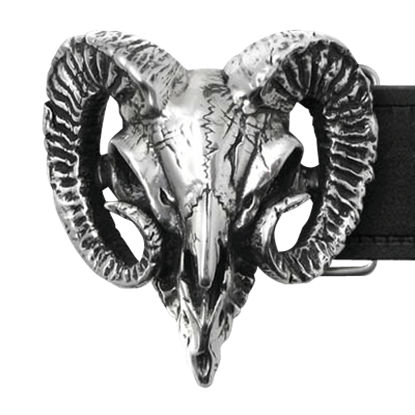 Now you too can display the symbolic power of this pagan symbol by wearing your very own Ram's Skull Belt Buckle! The Alchemist Belt Buckle is a portrait of the undead philosopher magus and an impressive decoration, besides. This skull is a classic element of gothic attire, making it on accessory that no gothic guy or girl should be without!